Was There Reverse Racism In Murder Case? Was there reverse racism in a murder case conviction, where a white man was found guilty of killing a black man? Donald Kagan had been in prison for murder for more than a decade when doubts about his guilt arose from an uncommon source: the former judge who had convicted him. The reason was more extraordinary still: The now-retired, white jurist felt he had been swayed by bias against Kagan, also white, in the killing of a black man. On last Wednesday, another judge upheld the conviction in the 1998 case. Acting Brooklyn state Supreme Court Justice ShawnDya Simpson said she found the case emotionally wrenching but that legally, there were no grounds to reverse the conviction. "It's unfortunate that my hands were tied" by the law, Simpson said. "This may be one of those cases that bothers me for the rest of my life." Kagan sat still, looking downward, after hearing her decision. His lawyers said they would appeal. Kagan, 40, has always maintained he was defending himself in a confrontation with Wavell Wint outside a Brooklyn movie theater in November 1998. Kagan said Wint had grabbed the gold chain he was wearing; Kagan shot him with a gun he said he had flashed at Wint earlier to ward him off. Wint was unarmed. Then-state Supreme Court Justice Frank Barbaro heard the case without a jury, convicted Kagan in 1999 and sentenced him to 15 years to life in prison. An appeals court upheld the conviction, saying there was evidence that Kagan escalated a scuffle that stemmed from an argument, not a robbery attempt. "We are satisfied that the verdict of guilt was not against the weight of the evidence," state Supreme Court Appellate Division judges wrote in 2004. But Barbaro, as time passed, wasn't so satisfied. 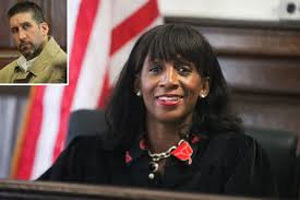 A former longshoreman and labor lawyer, onetime mayoral and congressional candidate and 24-year state assemblyman, the Democrat had retired from the bench in 2003 after six years as a judge. As he read news accounts about wrongful convictions, he started to question his verdict in Kagan's case. Re-reading the transcript, the longtime civil rights advocate became convinced he had done an injustice: His own hatred of anti-black racism had tainted his view of the conflict between Kagan and Wint, leading him to believe Kagan acted out of bigotry and misinterpret facts that supported his self-defense argument, the former judge said. "I saw a black man being killed by a white man, and that triggered my unconscious in ways I wasn't aware of," Barbaro said Wednesday by phone from his home near Albany. Although he was convinced at the time of the trial that he conducted it justly, "when I came to the conclusion that I had made a mistake, I've been tortured by this ever since," said Barbaro, who contacted Kagan's lawyer, who asked a court in 2011 to overturn the conviction. Barbaro said he was "outraged" by Simpson's decision and hoped Kagan's planned appeal succeeded. "The man was not given a fair trial. Those facts are irrefutable," he said. The Brooklyn district attorney's office argued the conviction should stand. Kagan has applauded Barbaro for coming forward with his misgivings. "Not many people would do that, especially after all this time," Kagan told the Post in a jail interview in December. But Wint's relatives expressed anguish at revisiting the case. "I thought everything was over with," his son, Wavell Wint Jr., told the Post in December. "It was a little nerve-wracking, but I'm satisfied with the decision," Wint's sister-in-law, Lisa DeJesus, said Wednesday. "She made the right decision. Why overturn something now?" Of course it was the right thing for the judge to do, go back and look at the trail. unfortunately kagan was not even given a chance. the judge let his moral values get in the way of the best decision for kagan who killed the black guy because of self defense. my issue with it is one, you took away time for him to spend with family. secondly, you retire then bring change your mind. lastly, how do you really make kagan happy? Wow! Talk about justice gone bad. I find it incredible that Barbaro would step forward, and I commend him for his actions. It's never too late to admit a wrong or mistake. At least he can live with himself knowing he came forward. Very unfortunate for Donald Kagan, as he has spent a long time in prison for basically defending himself. What kills me is Simpson basically does nothing. So much for the law. I guess that fact his sentence is almost over is the blessing in the end, I wonder if she can live with what she did? Why could Simpson not change the conviction? I do not know much about legal studies, but even the judge that first convicted Kagan admitted he had made a mistake in his decision. Seems like the justice system isn't actually bringing about justice to the innocent. I also understand why the relatives of the deceased African-American would be upset that the case was revisited, because they yearn for closure, but if Kagan is not guilty then he should not have to spend any more time in jail. It saddens me to think that I could be wrongly accused of committing a crime in the future. You have a good point in bringing up the trial again could bring unwanted emotions towards the issue with the African American family. This case is significantly different than others since the victim was an African American and the judge admitted he made a mistake. Racism is many places but the place where I think it is the hardest to deal with is this certain thing with someone being put in jail or committing a crime based on someones race. Being accused of something you didn't do or put in jail because there is bias in the court against you would be such a hard experience and I hope that the court system really tries to decrease the amount of those trials. I find it amazing that stories like this one are actually very common. Everyone is biased in their own way. The justice system is set up a certain way so different citizens with different views can all agree or disagree together and then the judge makes the punishment. When no jury is involved I feel like it is not a fair trail to have one person decide. I think that every murder trial should have a jury to decide the fate of the defendant because in cases like this, it's only fair. Our judicial system has flaws just like anything else - we are only human. I find it troubling that a man sat in jail for an extended period of time because the judge made an emotional decision that did support the facts of the case. Like a lot of things within our government and laws, things need to be changed. It's unfortunate. This country is slowly declining and it's becoming more of a government controlled society that does not listen to the people that keep it going! I agree especially when dealing with a case that has a sentence as long as this one did. I think every case should have a jury. That is part of our system to have a fair trail. Every case should be taken to trail with a jury to avoid sending innocent people to jail like this case. I believe, that as a whole, we as people, continuously make emotional decisions. I do believe that the judge was wrong by establishing his conviction based on emotional reactions. We, as a country, use the Common Law system and trust our judges and jury's to make decisions based on factual evidence, not emotional reactions or social prejudices - emotional reactions and social prejudices, I believe, are hard wired into our DNA and minds as we are put into this world. Why you might ask? I'm not sure. I believe that it could be evolutionary in nature and made more a part of us as we get older and experience the negatives of life. I believe that Kagan was falsely convicted and should have an opportunity to appeal his case. I don't agree with murder, but in self-defense, anything can happen. I agree with your statement and don't understand it either that us as a whole fall into the emotional trap. At times it makes sense like patients and doctor close relationships but in terms of the court system, it's hard to find the full truth and figure out really what should have been done here. The part that I like to think about is that respect is something that normally is earned by an individual from another but in the trial of Kagan, was he the one that had it coming and of the question of race? Like you said it's in our DNA and we have to go against what we have wired in us to think objectively in these types of situations. I do believe this as well. Just like the judge made an emotional decision so did Kagan when shooting the man. Regardless of emotions, you are right we rely on our system to be fair. The case should have been brought to trial and though it wasn't it should be made right now by giving him the chance to appeal his case. this is the flaw of the american leagl system. from reading essays by Holmes an old supreme court justice I have learned the fallacies of the judicial system. Justice and law is arbitrary what ever works best at the time really. In 1999 Kagan was guilty and it worked, at the time. now over a decade later its wrong and the same situation for many other people. but what can you say? The system is flawed and there is nothing that anyone can really do about it. #bummer. I'm liking the hashtag at the end! The thing is, there can be something done about the flaws of our governmental and judicial system. Will it solve all problems and will it be perfect? No. I think it starts at the top. We need the right leader as president so he can place the right people in office to oversee and control where the problems lay. I believe that the flaws and corruptions that happen in the lower-level agencies is a direct reflection of our political parties and leadership. I agree that our system is flawed and does not always uphold the promises is makes to the public. The thing that frustrates me about this case is that now it is brought to their attention that their could have been a mistake made and their given the chance to appeal it but still deny him of that. That does make sense. If the legal system has made a mistake they need to correct it so innocent people are not in jail. Yet another instance in where justice does not take care of the innocent. Like so many other things in our systems, the most money wins, or whoever knows and manipulate the laws not matter if the person is in the wrong. Something as easy as divorce should be, proves my point. I have lived it filed bankruptcy because of it and continue to live in manner that my daughter and I should not have to, why? Because I can't afford to get the right attorneys to defend me for things THAT WERE IN THE DIVORCE DECRE IN THE FIRST PLACE. What is wrong with this picture? I was told that my divorce decree isn’t worth the paper it’s written on. Even though it went through the courts it’s up to each party to do what it states. $158,000 later I live the nightmare. Keep in mind Donald sentence is almost through. He already has paid dues he should not have had to pay. Let's hope they will help him when he gets out, for I'm sure most of you are aware of how difficult it is to find work after prison. His problems may have just begun. I do agree that judges do not always defend the innocent. He was not even given a jury to hear the case. The case should have been taken to trial especially when dealing with a sentence as long as this one. Who knows if race was involved or if the man was trying to get the man off him for robbery. Granted he should not of shot him for something as minor as that especially cause his life was not being threatened. I think the case was being handled in the wrong way because the two men were of different races the judge automatically thought that is was an act out of racism and that the man would be punished for that. Racism has always been an issue in America, but when it comes to justice people need to more clear and not only think it's about racism every time when there are a white and black person involved. This will be a problem until the end of the world. there will always be those people that are raised by their racist grandfathers, or those who have a dark skinned enemy that turns them for reasons unnecessary, those who just flat out have no other way of thinking. Although there are so many people like that it isn't just white people against black people, there are many other races that go with this problem. sometimes its the blacks fighting for racing with the whites, the Hispanics beating on the blacks. Every case out there isn't going to be considered a racist case although we sometimes make it into that. I personally think that they we should think more rationally especially the judges when you are on a high level position like that you should absolutely put racism away, but I’m not saying that Donald Kagan did the right thing that killed the black man, especially he was unarmed and only rob attempt but however the judge should have be more considered about the whole case that shouldn’t convicted as a murder, because it was more self-defense.